I have been carrying around two crochet hooks for many years, in the first picture you can see a close up of these hooks. Notice the price on each one..... when do they stamp the price on anything now? 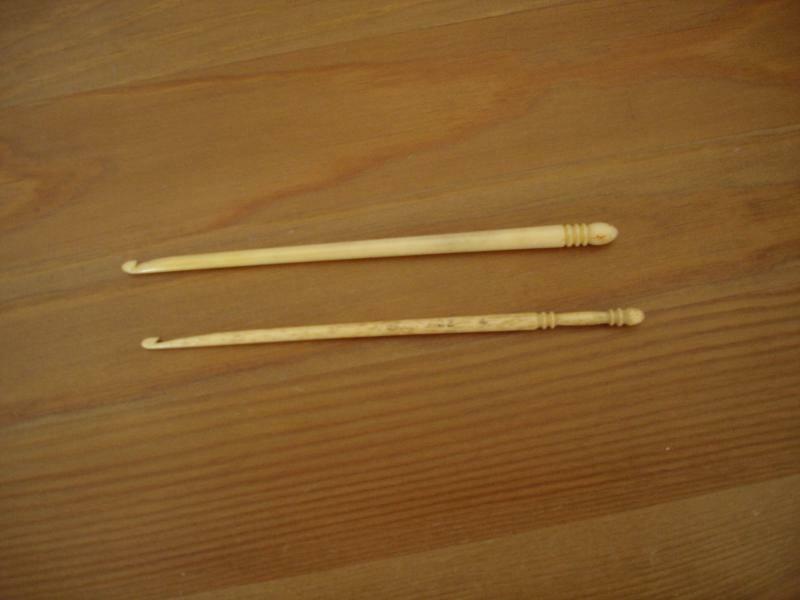 My Aunt lived in Alaska and sent to my mother the wale bone hook in the second picture, with it is a walrus bone hook that my sister bought for me when she was in Alaska. Very cool and some old hooks. The last ones are sort of like the ones I use, except they have soft handles, or wooden handles. I have some old hooks, and even a few Boye's with 35c prices stamped on them too. Also have a couple of bones just like yours! I only purchased them a few days ago from a charity boutique, I think they were four dollars USD and came with a couple of very old metal of some kind- a dull pewter-ish look to them. It won't let me edit my post again ! My bone(? or not) hooks look just like yours! Don't they? This is not all of my hooks, but ones I felt like taking a picture of before I got tired of taking photos it is a pain to have to pose them all, then go through the whole uploading/copy pasting etc etc. It is tedious. 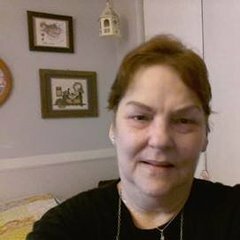 I wondered if acquiring yarns and tools is difficult where you are located, Dollyg? My cousin is overseas but not in the gulf, but in N Africa, sheep are in the millions and millions there (all the meat eaten there is mutton!) but he says a lot of sheep herders just THROW AWAY all the wool that is sheared, as its too much trouble to wash/process/spin etc all that wool. They are meat sheep, not grown primarily for their wool, but still! all that wool- WASTED! Some enterprising person could make a mint in spinning all that "waste" wool. There are photos of his sheep on my flickr account, you just have to flip through pages. All of my hooks, I have a bunch more I haven't uploaded pics of yet, are old. I get them at old charity places and thrift stores of all kinds. Some are gotten by accident: a few very very old ones were tucked hidden away inside balls of wool yarn I bought. Some purchased in sets, all very cheaply - I haven't paid more than 4 dollars for a handful of them. I only purchase ones that say Made in USA or England or Germany, no "China" or "Taiwan" for me thank you very much. It is pure luck that I find so many old hooks. I also have knitting needles too, but that was when I was not sure which hobby I was going to take up. 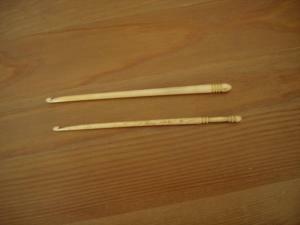 Actually I do not collect the crochet hooks, they were from my mother's crochet bag of years ago. Normally I buy all my craft things from the states when I go visit my sister..... much cheaper there and such a variety to choose from!!! I don't "collect" them either, per se' , I only buy what I can use. It is not often I find them and usually only find a few at a time for sale. I just prefer old things, just for the nostalgia and other reasons. 2manythreads, I suspect your second photo plastic hooks are from circa 1970, the first hooks that I bought around that time are identical to these. Your third pic is interesting, I've never seen one with a hole in the finger grip area. I also have some old 5¢, 10¢, and 35¢ steels, I think the 35¢ steel ones might be 1970 vintage as well. Yes the one with the hole in the middle- I am not sure if it is a mere product design or serves some unknown purpose. Soft finger grip that dissolved over time - That makes total sense! But, would they have had a soft rubber grip back then...? This could be from the early part of 20th cent. I'm thinking at the latest, 1940s. I am NO hook expert I just went by the patina of it and the style. I like those wale bone hooks:). And talking about hooks...Until few months ago I was using those metal cheap hooks (no handles). I like to crochet Amigurumi and I crochet them very tight & that was very painfull . Those cheap hooks were hurting my hand a lot. I did bought a rubber "sleeve" from Joann.com. 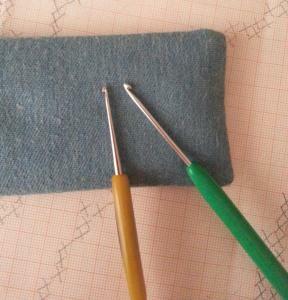 That helped a little but it was not very good and it only fit one size of hook..
About few months ago I bought from Joann store couple "Clover" hooks, just to try. My goodness what a change!, they are so comfortable! . After I try them I went on line and bought more of them so I could have them in every size that was available. I am not trying to advertise those hooks in any way here. But, those hooks are design for fit & comfort perfectly. I Think those Clover hooks will save my hands:). I do have only one regred and that is: WHY I did not bought them sooner??? . I would not give up my Clover hooks for anything! . About few months ago I bought from Joann store couple "Clover" hooks, just to try. My goodness what a change!, they are so comfortable! . After I try them I went on line and bought more of them so I could have them in every size that was available. I am not trying to advertise those hooks in any way here. But, those hooks are design for fit & comfort perfectly. I Think those Clover hooks will save my hands:). I do have only one regred and that is: WHY I did not bought them sooner??? . I would not give up my Clover hooks for anything! . Me too- wouldn't trade them for anything. I just this week bought the K and L hooks. Can't wait to use them. just think- in olden times needlework knitting crochet etc was compulsory for small girls in school. Well, they did have to make all of their clothes and things too. 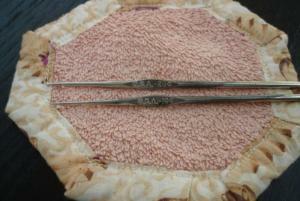 fiy antique and very old crochet hooks and things are quite inexpensive on ebay as well. Lace and doilies and even centuries old textiles go for pennies! I don't get it? is needlework just not appreciated? to think of all the hours spent making the items, plus the expertise.. wow. In this months issue of Vogue and Glamour I noticed QUITE a few knitted and crochet applique'd and crocheted clothings. I wonder if it is catching on. Maybe because of Duchess Katherine and all of her crocheted dresses and tops she wears? She has a lady that does her clothes for her, and of course the famous baby she had with her crocheted outfit everyone was copying.